We love this in the summer. It’s delicious, light, and easy to make. 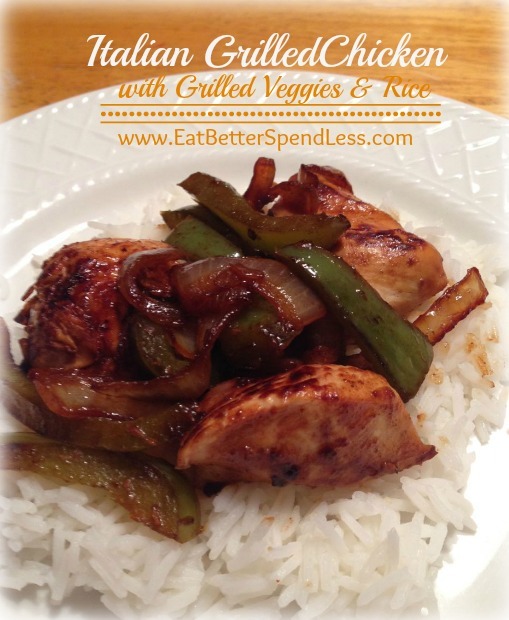 I used to make kabobs using this recipe but I soon figured out I don’t have time for that! So, it all went into a large skillet and we called it good. And it was good! OK, enough babble, try this dish, I think you’ll like it. Proof that you can have super-easy meals while still eating healthy! Marinate chicken and veggies in a resealable bag with salad dressing. Refrigerate until ready to make supper. Bring 2 cups water and 1tsp salt to a boil. Add rice. Stir, turn burner off and cover. Cook without stirring 20 minutes. Heat grill pan (or large skillet) with 1-2 TBSP oil. Grill veggies (including pineapples) and chicken about 10 minutes until done. Transfer rice onto a large platter. Pour chicken mixture on top so juices will mix into the rice.